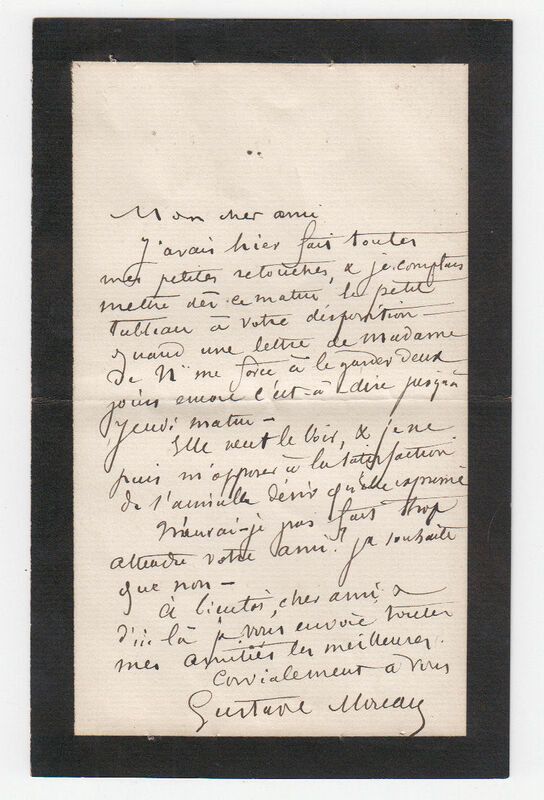 Autograph Letter Signed ‘Gustave Moreau’, addressed “Mon cher ami”, saying he has put the finishing touches on the little painting which is now ready for his correspondent, explaining that a letter from “Madame de N” means that their meeting must be adjourned a couple of days to give her an opportunity to see the picture, hoping this will not be too late. In French. A very good one page example, 7 x 4 inches, deep black borders, integral blank leaf. Undated. Gustave Moreau (1826 – 1898), French Symbolist painter.